The Ecophobia Hypothesis grows out of the sense that while the theory of biophilia has productively addressed ideal human affinities with nature, the capacity of “the biophilia hypothesis” as an explanatory model of human/ environment relations is limited. The biophilia hypothesis cannot adequately account for the kinds of things that are going on in the world, things so extraordinary that we are increasingly coming to understand the current age as “the Anthropocene.” Building on the usefulness of the biophilia hypothesis, this book argues that biophilia exists on a broader spectrum that has not been adequately theorized. The Ecophobia Hypothesis claims that in order to contextualize biophilia (literally, the “love of life”) and the spectrum on which it sits, it is necessary to theorize how very un-philic human uses of the natural world are. This volume offers a rich tapestry of connected, comparative discussions about the new material turn and the urgent need to address the agency of genes, about the complexities of 21st century representations of ecophobia, and about how imagining terror interpenetrates the imagining of an increasingly oppositional natural environment. Furthermore, this book proposes that ecophobia is one root cause that explains why ecomedia—a veritably thriving industry—is having so little measurable impact in transforming our adaptive capacities. 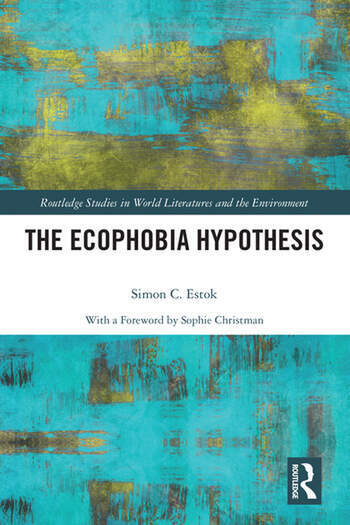 The ecophobia hypothesis offers an equation that determines the variable spectrums of the Anthropocene by measuring the ecophobic implications and inequalities of speciesism and the entanglement of environmental ethics with the writing of literary madness and pain. This work also investigates how current ecophobic perspectives systemically institutionalize the infrastructures of industrial agriculture and waste management. This is a book about revealing ecophobia and prompting transformational change. Dr. Simon C. Estok is a Senior Fellow and Full Professor at South Korea’s oldest university, Sungkyunkwan University (established in 1398), where he teaches literary theory, ecocriticism, and Shakespearean literature. Estok is also a recipient of the Shanghai Metropolitan Government "Oriental Scholar" Award (????) (2015-2018) at the Research Center for Comparative Literature and World Literatures at Shanghai Normal University. His award-winning book Ecocriticism and Shakespeare: Reading Ecophobia appeared in 2011 (reprinted 2014), and he is co-editor of a book entitled Landscape, Seascape, and the Eco-Spatial Imagination (Routledge, 2016). Estok also co-edited International Perspectives in Feminist Ecocriticism (Routledge, 2013) and East Asian Ecocriticisms (Macmillan, 2013) and has published extensively on ecocriticism and Shakespeare in such journals as PMLA, Mosaic, Configurations,English Studies in Canada, Concentric, Neohelicon, and others. Dr. Estok received his MA and PhD in English Literature from the University of Alberta.